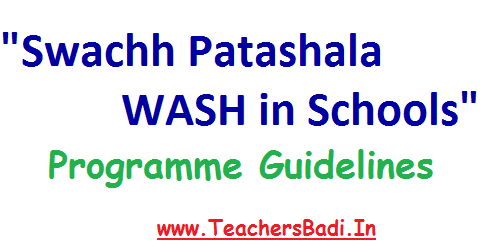 Guidelines for implementation of "Swachh Patashala- WASH in Schools" Programme in all schools: School Education Department, Telangana has adopted a three pronged approach to the implementation of Water, Sanitation ad Hygiene Programme in Schools (i) Provision of infrastructural facilities, (ii) Provision for Operation and Maintenance and (iii) Behavioural change in all stakeholders, focussing on Users-i.e., Children. As all the schools are provided with toilets, it is now important to concentrate on the Operations and Maintenance of the facilities and to bring positive change in behaviour of all the stakeholders, including users, i.e., children. With this objective, orientation is given to all the headmasters in the state. Rc.2315 - SPD Message: All the District Educational Officers, Project Officers of SSA are informed to take necessary action to implement the guidelines on implementation of Water, Sanitation and Hygiene (WASH) in Schools (WinS) programme communicated herewith and to monitor the implementation from time to time. They are requested to take necessary steps for formation of school cabinets and oath taking ceremony on 15th August, 2015. 1. To operate, maintain and upkeep all the Water, Sanitation and Hygiene facilities in schools. 2. To develop positive behaviours about health and sanitation. 3. To translate the knowledge into ACTION. A. Non-negotiable issues to be followed in schools. B. Formation of School Cabinets. A.1. Non-negotiable issues to be followed in schools. Every School should have one functional source of water, within the school premises. In this regard, wherever there is no such source, Headmaster should take initiative and approach the gram panchayat, for provision of water, mentioning about the G.O.RT.No.105 dated 20.05.2015 of the School Education department which formed village level committees for maintenance and monitoring of toilets and drinking water facilities. Water should be available for drinking, cooking MDM, or usage in toilets and other cleaning purposes. One functional toilet unit for boys and one functional toilet unit for girls in every school with water facility- either through overhead tank or at least through a bucket and mug. 1. Toilets: Maintaining toilets and urinals in a functional state, i.e., water supply, cleaning, proper usage. A dust bin should be placed in girls toilets for disposing used sanitary napkins. - Provision of Safe drinking water for drinking 86 cooking. - Safe handling of drinking water. - Cover on water container. - Free from contamination; use ladles with long handles to take water or container with tap. - Arrange for hand washing- soap/ soap water, and water. 3. Personal hygiene: Checking whether the children have -cut their nails, wore clean clothes, wore footwear, and combed hair, by school cabinet members every day, in the class room. Food handling and preparation with utmost cleanliness. a. All food handlers (MDM cooks and serving personnel) should remain clean, wear washed clothes and keep their finger nails trimmed, clean and wash their hands with soap/ detergent . Food handling personnel should avoid certain hand habits - e.g. scratching nose, running finger through hair, rubbing eyes, ears and mouth, scratching beard, scratching parts of bodies etc. during handling of food. b. If cooks or helpers are suffering from any disease likely to be transmitted via food, e.g. diarrhoea or vomiting, infected wounds like, skin infections, jaundice or sores, they should report to the HM. a. Placing dustbins in every class room. b. Compost pit in a corner to throw MDM wastage. c. •Any other local specific mechanism to be evolved for safe disposal of litter. a. Attention should be paid to children who are absent for more than a week- Send CRP/ Teacher/ members of school cabinets to find out what the problem is. Reasons for absenteeism, incidence of diseases should be recorder by the committee members and should be presented in the assembly on every Wednesday. b. School cabinets should arrange for awareness sessions and campaigns on communicable diseases, seasonally spread diseases, methods of prevention of diseases, healthy eating habits etc., atleast once in a month. After defecating, before eating food, handling drinking water of food. Brushing teeth twice a day, taking bath twice a day, combing hair and wearing clean clothes, wearing footwear. a. Urinating and defecating only in toilets, urinals. b. Flushing water, keeping toilets clean. c. Requesting for latrines under NBA/ Swachh Bharath Abhiyan for their home. 5. Cleanliness: Throwing litter in dustbins and compost pit only. a. Using handkerchief while sneezing, coughing- to prevent disease transmission to others. b. Not spitting in open areas. c. Prevention of communicable diseases by knowing preventive measures, by creating awareness among family members and community. The implementation of Swachh Patashala/ WASH in Schools programme and students cabinets should be monitored by all the inspecting and monitoring officers of school education department and SSA.